CROCKETT – There was no yelling. There was no talking over someone else. There was no posturing for the sake of posturing. For the first time in several months, the Crockett City Council met in a drama free meeting as the city leaders acted like adults and not adolescents. Mayor Joni Clonts called the meeting to order and following the invocation and pledge, she opened the floor for public comments. The first person to speak was Wanda Jordan, the Houston County Historical Commission Chairperson. “We are here with the DAR (Daughters of the American Revolution) and veterans groups. We are hosting – jointly – the World War I Centennial event that will take place at the courthouse at two o’clock in the afternoon on Sunday (Nov. 11). This is the 100th anniversary of the armistice that ended World War I,” Jordan said. She added the armistice was actually signed at 11 am on Nov. 11, 1918 but because of church services the event had been pushed back until 2 pm. Following her address to the council, Jordan was presented with a proclamation by the mayor. 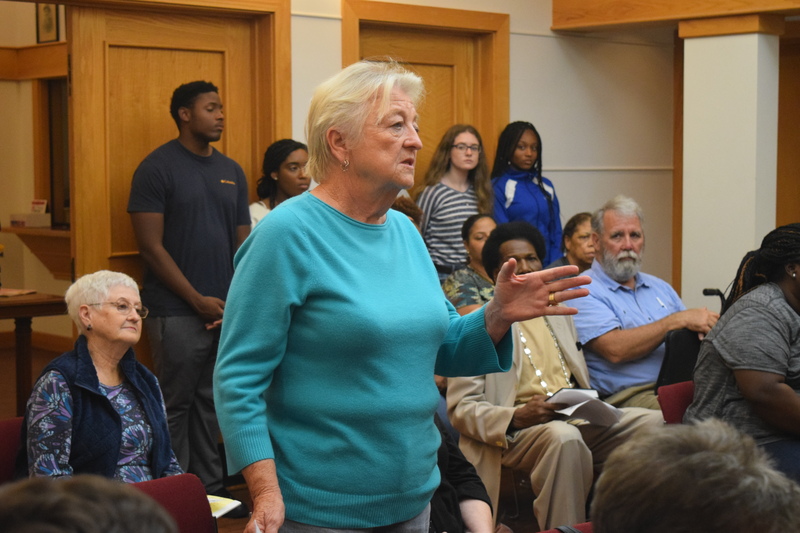 Also during the public forum, Crockett resident JoAnn Beasley suggested the city should host a town hall meeting for residents. “I understand we have two papers, The Messenger and the Houston County Courier. Some people cannot get an understanding out of the paper as well as coming to ask questions to the mayor or economic development board as well as council members. I would like to suggest we have a town hall meeting,” Beasley said. Following the public forum, Councilman Darrell Jones said he would like to address the Angelina College closure. He said while it was reported in the paper, no one from the college had contacted the Crockett Economic and Industrial Development Corporation in person or in writing. As the meeting continued, the council was asked to consider and approve the adoption of Navarro Road and Pease Street by the Crockett High School National Honor Society as part of the Adopt-a-Street program. A motion was made, seconded and unanimously approved to allow the NHS to adopt the two roadways. Crockett Police Chief David “Buddy” Cross reported the police department received 331 calls for service during the month of October which resulted in 45 arrests. There were 25 traffic citations issued and 63 police reports filed. Crockett Fire Chief Jason Frizzell reported the fire department responded to 46 calls during the month of October. Twenty-eight of the calls were in the city limits while 18 were in the county. There was one structure fire in the county. A list of surplus items – no longer of any use to the city – was approved to be auctioned online or scrapped/destroyed.